Many in the media portray the global warming issue as “the global average temperature has increased 0.8 degrees during the 20th century”. But climate scientists do not claim that this was all due to CO2 – only since the 1970s. The figure below left shows the global average temperature anomalies (from the Hadley Climatic Research Unit (CRU) which provides the data used by the IPCC [http://hadobs.metoffice.com/hadcrut3/diagnostics/global/nh+sh/]). 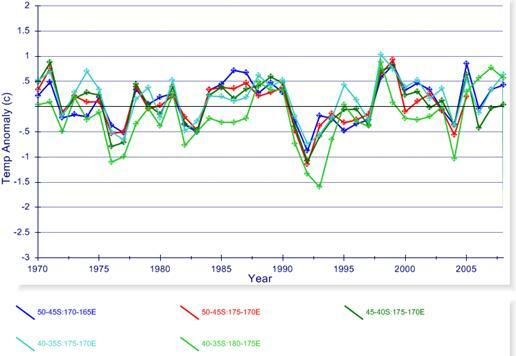 The figure below right superimposes the CRU temperature anomalies on the IPCC graph of model outputs. (IPCC 2007 AR4 Figure SPM-4 [http://www.ipcc.ch/pdf/assessment-report/ar4/syr/ar4_syr_spm.pdf]) In this figure, the blue shaded bands show the result climate model simulations using only natural forcings. Red shaded bands show the result model simulations including anthropogenic CO2. 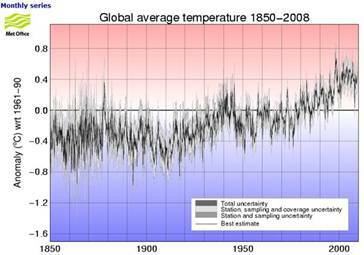 The IPCC attributes “most” of the warming since 1970 to human-produced (anthropogenic) greenhouse gases – mainly CO2. One must keep in mind that the IPCC was formed in 1988 with the purpose of assessing “the understanding of the risk of human-induced climate change.” -- i.e. it is based on the a priori assumption of “human-induced climate change” – there was never an attempt to evaluate the scientific evidence of the cause. 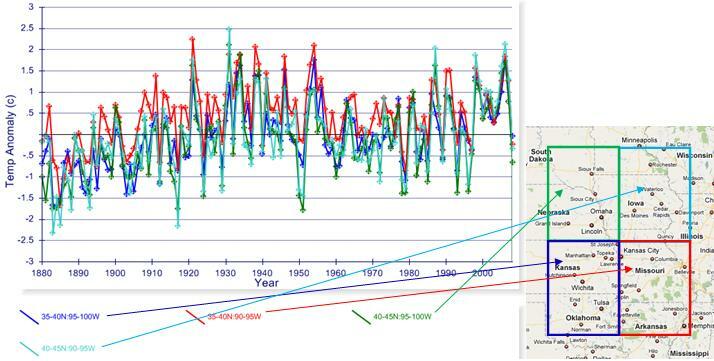 (See: http://www.appinsys.com/GlobalWarming/GW_History.htm for the history). The following figure examines the global temperature regimes over the past 70 years (from the temperature graph shown above). 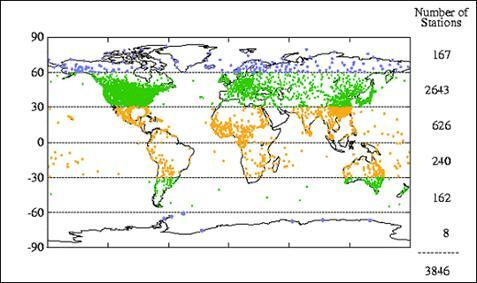 Temperatures can vary widely from year to year, generally within a 0.5 degree range (the green bounded rectangles below). Following the 1945 – 1951 cooling event, the temperatures were in a stable regime until the 1976-78 climate shift which resulted in a net warming of about 0.2 – 0.3 degrees. 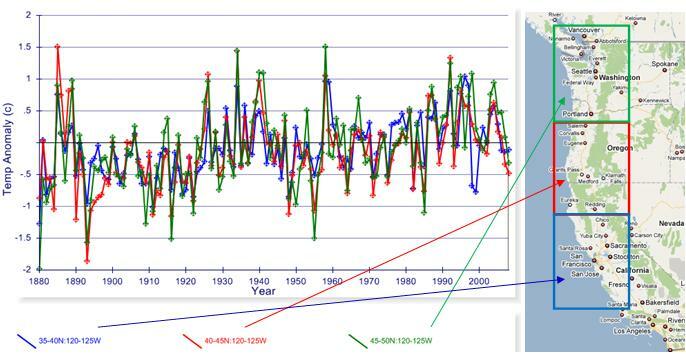 Another stable regime is exhibited for the next almost 20 years until the 1997-98 El Nino, which again resulted in about a 0.3 degree net warming. Since then there has been no further warming for the last 10 years. All of the warming in the last 70 years occurred in two extremely short periods. And this is the time frame covering the entire period officially designated as having warming due to CO2. 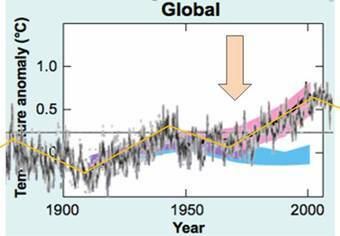 Warming Significant Only in 10-20% of the World – Where is It? 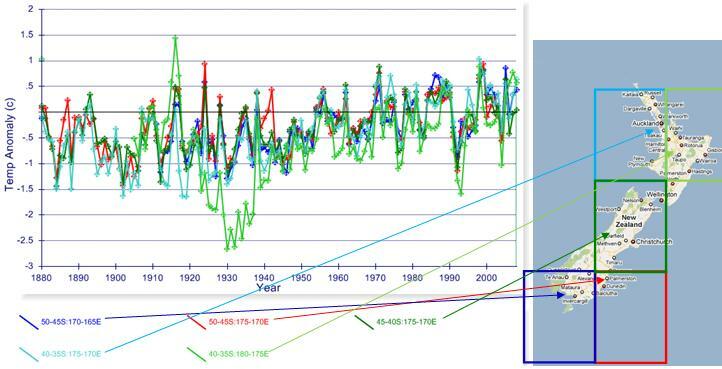 Prior to the satellite era, reliable long-term temperature measurements have only been made in “western” countries. 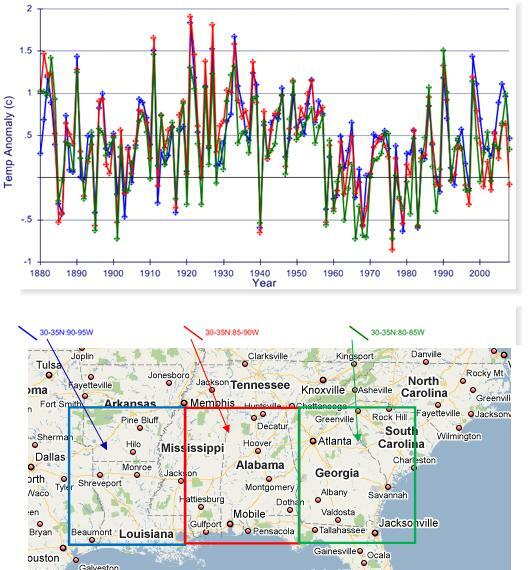 The following figure shows the distribution of temperature stations that have data spanning at least 1960 - 1990. Most countries have very sporadic data. The annual temperature variation in a local region is much larger than the global average portrayed by CRU. The global average displaying an apparently small amount of variation is a statistical artifact created by averaging areas that have different trends. One of the things that make the US unique is that more than 50% of the world’s temperature stations in the GCHN database are in the US – the most long-term and reliable records are available in the US. The warming occurred mainly in 1988 – 1990. The following figure shows the same data as above for the official CO2-warming era, 1970 – 2008 – there is no warming at all in New Zealand during the last 40 years.